Crop Circles seemed to be a phenomenon that was exclusively Modern Times associated with UFOs, paranormal weather, and generally Weird Stuff, but records of unusual and unnatural patterns in farmer’s crops date back to the 1800’s and beyond. What is it about the Crop Circles myth that always seems to grab so much attention? While Crop Circles are not a myth—they do indeed exist—what makes the crop circles has often been up for debate, and some explanations certainly do fall into the myth category. A crop circle is almost exactly what it sounds like, but rather than crops planted and grown in a circle, it is a circle of crops that have been pressed down or even burned down in a pattern. From a woodcut discussing “The Mowing Devil” in the 17th century to strange patterns reported in the 18th to the modern day launch of Crop Circle Mania in the 1970’s and 1980’s, the discovery of crop circles always moves through two, and sometimes three, phases. First, there is the wonder at discovering something so unexpected and unnatural. Second, there is the questioning period, where observers wonder “how was it done?” Third, there is the investigation period, where skeptics and fanatics—and hoaxers—all descend upon the scene and let fly with their explanation and reasoning. Whatever else happens from there one thing is certain—it is always entertaining to watch. While the Mowing Devil woodcut of 1678 actually referred to a farmer saying he would rather have the Devil cut his grass than pay the mower’s rates, most other early mentions of crop circles come along with the question of “how did it happen?” People have floated many theories over the years, from spirits and ghosts to strange weather phenomenon like mini tornadoes to alien beings leaving behind a message. People with scientific backgrounds have put out theories that ball lighting could have created circular patterns in fields of wheat, and the same for whirlwinds, but what of some of the more intricate patterns, such as the Stonehenge Julia Set in 1996, with over 150 circles? Alien beings may offer a more likely explanation—dependant on one’s belief in the existence of such—except for one problem, in the form of two gentlemen; Doug Bower and Dave Chorley. These two hoaxers revealed in 1991 that there were responsible for a rash of crop circles in the 70’s, the very group that sparked so much media attention. Even with their admissions, however, couldn’t aliens be responsible for some of the other crop circles—like those in Russia, for example? Carl Sagan, in his book “The Demon-Haunted World: Science as a Candle in the Dark” offered a logical argument to address this question. 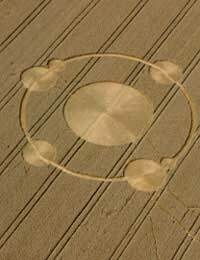 While there is zero hard evidence that Aliens, Ball Lightning or Spirits ever created a crop circle, there is a ton of hard evidence that they have been created by man. Interestingly the Corp Circles Myth might be more myth than curiosity to this day if it wasn’t for Doug Bower’s concern for his marriage. His wife had grown suspicious of all the time away and mileage put on his car, and rather than have her think he was cheating on her, he confessed to her what he was up to in the middle of the night. From there he went on to reveal it to the papers, just to be on the safe side to hand on to Mrs. Bower.